A little warm weather is all the excuse we need for hosting a BBQ – come rain or shine, the Great British pursuit of BBQ-ing is among the highlights of a great summer. Choosing the right BBQ that can handle your requirements is more than just a question of taste and the choice can seem a little overwhelming. Our BBQ buying guide is designed to help you choose which one will suit your needs best without getting your fingers burned. It’s a good idea to decide whether you’re going to go for a gas or charcoal BBQ before anything else as this will inform the rest of the buying process. Gas models make use of gas to cook the food. In terms of consistency, they can’t be rivalled while charcoal BBQ’s are the traditional BBQs which use charcoal, fire, and nothing else. It’s generally agreed that food cooked over charcoal gives that authentic flame-grilled taste that’s hard to beat. The food is allowed more time to cook, retaining more moisture as a result. This leads to a succulent texture that’s pretty much unrivalled outside of top-drawer restaurants. The flipside of the argument is that gas BBQs are far more consistent. Gas BBQs just work, regardless of weather or who is operating them. You turn them on, you fire them up and then you cook. Because they are so reliable, gas BBQs tend to be more expensive, so it may be that your budget determines this decision for you. In the end, choosing between charcoal and gas is simply down to which you value more: convenience, or authentic taste. Fortunately, there are fantastic BBQs of both kinds so whichever type you go for, you’ll find the right one for you. BBQs range in price from just over £50 right the way up to £2500, meaning you can opt for a choice within a modest budget or spare no expense and go for one with all the bells and whistles. The amount of quality you can get for your money is substantial, so work out your budget and then stick to it. It’s worth considering the running costs of a BBQ too. With gas you often “rent” the cylinder, and companies charge you for the gas you purchase each time. A typical cost for gas-only is around £30 for 13kg, which should give around 12 hours of cooking time. A typical 7kg bag of charcoal should cost between £7 and £10 and provide enough fuel for up to three medium BBQs. Every BBQ has a specified cooking area i.e. the size of the metal grill. For up to four people, a smaller cooking area of around 1800cm2 will be fine. For up to six people, 2000cm2 to 2500cm2 should suffice. Beyond that, you’re looking at a much larger surface of over 2500cm2. 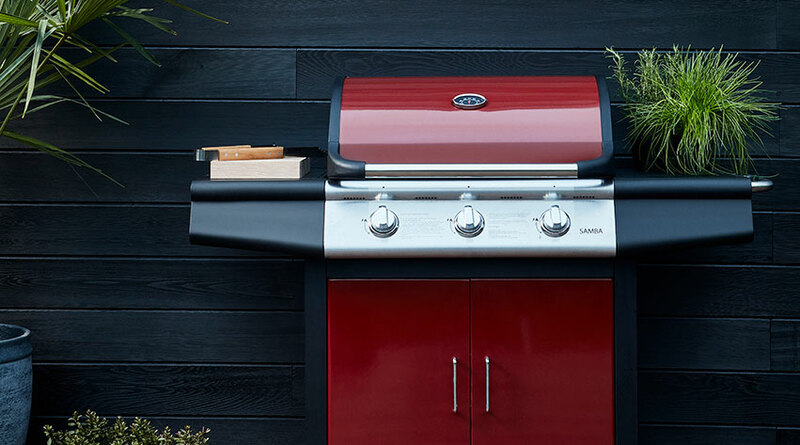 If you’re the neighbourhood BBQ master and regularly host garden parties then it’s wise to look at a unit that has griddles and warming racks. These will allow you to keep already cooked food at a warm temperature. Chrome plated BBQs look great when they haven’t been used, but you’ll need to clean them thoroughly after every use, otherwise they’ll start looking quite tired and worn. Stainless steel BBQs are easy to clean and maintain, and are a bit more durable than the chrome models. Cast iron BBQs are a great heat source and they definitely look stylish. However, it’s important to remember to wipe the grill with cooking oil both before and after use: cast iron can rust. Porcelain-coated BBQs are the luxury choice, as the coating is a rust-preventative. On some occasions, these models will come complete with ‘flavouriser’ bars designed to create a smoky taste using juices and fats that drop down from the grill. If you’ve got the funds, porcelain is worth the investment. BBQs have evolved and that includes the range of food you can cook on them too. Kebabs with peppers, mushrooms and halloumi (or other variations) can now happily sit alongside sausages and burgers as a tantalising meat-free option or as a tasty way of getting veg into your BBQ meal. As a result, it’s useful to have a griddle for cooking those things that could easily slide through the bars on the main grill such as veg, potatoes and cheese. Griddles also mean that you can cook eggs, resulting in perhaps the greatest gift of all: the barbequed full English breakfast. It’s worth a try! Not all BBQs come with a cover but it’s usually worth getting one that does. A hood can act as a windbreak (invaluable for charcoal BBQs) and a complete cover can be used to maintain heat within the unit, almost like a pressure cooker. This is great for cooking large joints of meat. There are a number of other features available on or with BBQ’s that you may wish to consider adding. Side burners, which are ideal for heating sauces and side dishes. Warming racks for keeping food warm but still away from direct heat. Thermometers, ideal for measuring temperature when the lid is on the BBQ. It’s worth taking the time to work out which BBQ offers the features you really want at the best price. You can purchase some of the above features as accessories later on, should you want to.